Should More Offices Replace Stairs with Slides? 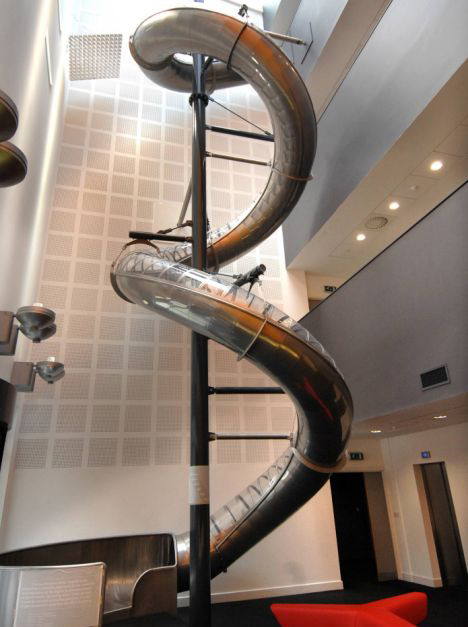 The correct answer is yes, more offices should replace stairs with slides. Many offices are jumping on the bandwagon and installing slides into their offices around the world. Is this crazy or a stroke of genius? The trend is growing, and rather than bringing fun into the office the general idea is to add a feel good factor and even potential ice breaker with clients. The office gym just doesn’t quite cut it anymore; larger corporate companies are looking for new ways to spice up the place. It is a well-known fact that the office environments affect the employee productivity. More recently neuroscientists have found a link between mental performance and factors that include the amount of natural light available, ceiling height and the view outside. Therefore large companies such as Google are making sure their offices are filled with inspiring designs and elements of fun in the hope to encourage creativity and co-operation. Corus Entertainment is one of the largest Media Entertainment companies in Canada. 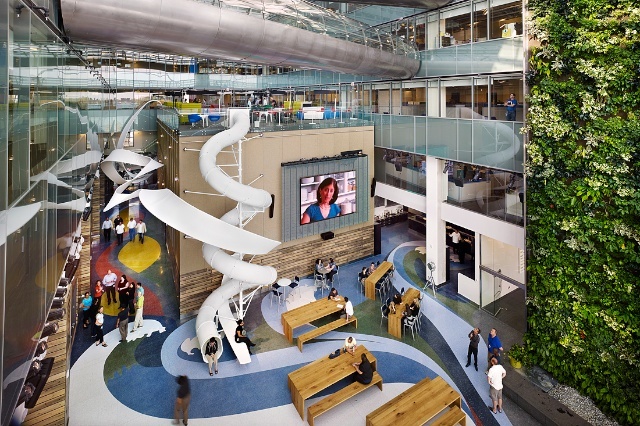 The new headquarters feature a three-story slide for employees to enjoy. The headquarters can be found in the Corus Quay Building in Toronto and also features a five story ‘living wall’ of vegetation which gives the building a greener and more organic feel. The Melbourne office of iSelect, a private healthcare insurance company boasts a giant slide dropping employees into a giant ball pool in matter of seconds. The iSelect team are proud of their office which also includes sleeping pods, a running track, soccer field and hammocks that look out to the ocean. The idea is to encourage creativity and offer a balanced working lifestyle. 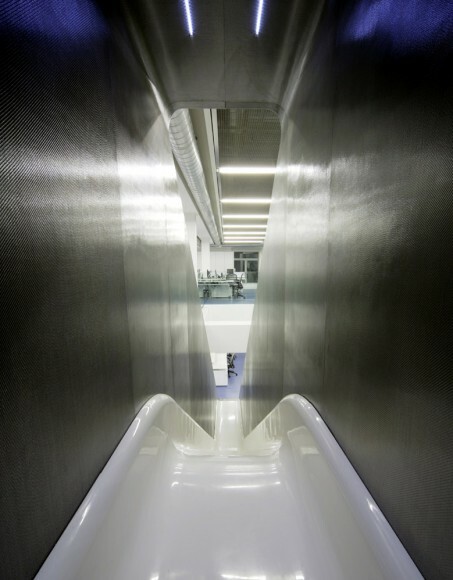 The Red Bull office in Soho, London is narrow and steep, running alongside a floating staircase. The idea behind office design is to add adrenaline and excitement, emotions that are associated with the the Red Bull brand and activities. The Electric Works office in Sheffield hosts a slide known as the ‘helter-skelter’ This is currently the largest indoor slide in the UK at 87-feet long. According to the designer Toby Hyam the slide conveys the idea of risk taking. Undoubtedly the slide will make for an unforgettable visit.